Super Bowl XLVII, between the Baltimore Ravens and the San Francisco 49ers, has the potential to be one of the greatest Super Bowls in recent years — not just because of the level of play these teams have demonstrated in the playoffs, but mostly because of the story lines all over the field. Ray Lewis, one of the greatest linebackers in history, will play his final NFL game, retiring after 17 seasons, hoping to win his second Super Bowl ring, making a return to the big stage after 12 years. The 49ers’ head coach, Jim Harbaugh, was Lewis’ teammate in the late 90′s, not to mention the brother of the head coach on the opposite side, John Harbaugh. There’s the obvious quarterbacks angle: Colin Kaepernick, beginning the season as the backup to Alex Smith and emerging as an explosive runner and very patient and accurate passer in the playoffs, and Joe Flacco possibly proving he’s part of the elite group of QBs in the NFL after years of criticism. One of the two — Randy Moss (49ers) and Ed Reed (Ravens) — will finally win a Super Bowl ring. The 49ers enter the Super Bowl as the favorites, but as you can see by the roads both teams have taken to the big game (see the infographic below), there isn’t that much of a difference between them in quality. This is probably the best ingredient to make sure Super Bowl 47 will be among the most exciting we’ve seen in recent years. Harbaugh Bowl, Harbowl, Harbaughl, Brobowl, SuperBaugh or my own personal favorite, Super Bowl XLVII. Whatever you want to call it, come Sunday the only thing that will matter will be what happens on the field between the San Francisco 49ers and Baltimore Ravens in New Orleans. With that in mind, here's how the teams will match up against each other this Sunday. The Baltimore Ravens' expectations have changed on offense since the beginning of this playoff journey. The Ravens were the 10th-best scoring offense in the regular season, but their production from week-to-week fluctuated dramatically throughout. But those regular season statistics mean next to nothing for the Ravens after sweeping through the AFC playoff bracket scoring 90 points in three games. Much of that is due to quarterback Joe Flacco once again bringing a greater level of consistency, composure and focus to the field in the post-season. Flacco's individual performances have improved significantly for multiple reasons, but maybe the most publicized is the impact of Jim Caldwell. Caldwell took over the offensive co-ordinator role from Cam Cameron at the beginning of December. He has improved the offense in almost every conceivable way. The Ravens' play-calling is less predictable, the execution is sharper than it was under Cameron and Caldwell has an understanding of how to best utilize his weapons, something Cameron consistently failed to do. Flacco's statistical production has sky-rocketed in the playoffs. He has completed just 54.8% of his passes, but thrown for 853 yards with eight touchdowns and zero interceptions. However, the Ravens' three playoff victories so far have come against less than stellar defensive opposition. The Indianapolis Colts' defense ranked 21st in points allowed during the regular season. A soft regular season schedule juked the statistics for the Denver Broncos defense, while on the day they played the Ravens, Champ Bailey had maybe the worst game of his career and Rahim Moore failed to make a routine play that would have ended the Ravens' season. A poor Patriots defense awaited in the Championship game, and a very limited Chandler Jones and injured Aqib Talib turned that poor unit into a downright awful one. In the Super Bowl, the Ravens will face a much stiffer challenge. For the past two seasons the San Francisco 49ers have ranked second in the NFL in points allowed. They are the most physically intimidating group in the league and the most consistent from week-to-week. The unit combines a rare mixture of superstars leading the way, with high quality depth throughout the whole defensive depth chart and the type of coaching that keeps every player clued into their responsibilities on every single play. Unlike the Colts, rarely does this unit need to be bailed out by their offense. Unlike the Broncos, this defense doesn't need a soft schedule to rank amongst the very best in the league. Unlike the Patriots, one or two injuries to key players won't stop them from being competitive. For the first time this post-season, the Ravens offense will face a defense of equal or arguably greater talent and depth. The Ravens may have Joe Flacco, Ray Rice and Dennis Pitta, but the 49ers have Justin Smith, Aldon Smith, NaVorro Bowman and Patrick Willis. The Ravens can add Torrey Smith, Anquan Boldin and Jacoby Jones, but the 49ers can counter with Carlos Rogers, Dashon Goldson and Tarell Brown. This balance of superstars and depth is going to force the Ravens offense to be creative. With two weeks to prepare, the responsibility falls on Caldwell to introduce that creativity. Flacco's production for the Ravens has primarily come on throwing the ball downfield. He is averaging over nine yards per completion, while Torrey Smith and Jacoby Jones are averaging over 22 yards per reception in the playoffs. Even Anquan Boldin and Ray Rice are averaging over 17 yards per catch. According to Pro Football Focus, Flacco throws over 25% of his attempts further than 20 yards downfield and has completed over 50% of those during the playoffs. That won't intimidate the 49ers. Through a combination of an excellent pass rush and quality coverage, the 49ers only gave up 38 passes of more than 20 yards during the regular season, good enough for third fewest in the league. Of course, during the regular season you don't see a player like Torrey Smith every week. Smith has the speed to beat any defensive back in the NFL on any given play. However, that speed is only valuable when teams leave him in one-on-one situations like the Denver Broncos did in the Divisional round. The 49ers don't typically expose themselves like that, nor are they under pressure to inadvertently do so by focusing elsewhere. Atlanta Falcons' superstar wide receiver Julio Jones was able to expose the 49ers' deep coverage in the NFC Championship game. Jones finished the game with 11 receptions for 182 yards and two touchdowns. However in the second half he only had three receptions for 23 yards before catching a 24 yard pass on the final play against prevent coverage. It took a monumental effort from Jones to take over the first half of that game, but once the 49ers adjusted their coverage his way in the second half, he was limited to short gains. With two weeks to prepare, they should take the same approach towards Smith. When teams do that, they expose themselves to Dennis Pitta, Jacoby Jones and Anquan Boldin. Boldin and Pitta are able to overpower most defensive backs/linebackers in single coverage, while Jones is always a threat to go deep with his speed. However, Boldin and Pitta won't be able to bully the 49ers' defenders the way they have most this post-season. Patrick Willis and NaVorro Bowman are two of the most physically intimidating coverage linebackers in the league, not to mention the two best all-around inside linebackers in the NFL. Dashon Goldson and Donte Whitner are big-bodied safeties who can run and hit in space, while cornerbacks Tarell Brown and Carlos Rogers play consistently physical football. Jones was able to expose the 49ers' physical approach in the NFC Championship game, but outside of Smith, who the defense can focus their coverage on, none of the receivers present the same matchup nightmare that Jones' athleticism and straight line speed did. The receivers should be able to get some success – they are still a talented group - but will it be enough? An obvious solution would be to run the ball, but that will be playing into a 49ers strength. Jim Caldwell must get creative with his receivers to free them from the 49ers' secondary. Maybe more importantly, he must also be creative in how he approaches running the ball. Ray Rice, arguably the best all-around running-back in the NFL, and explosive rookie Bernard Pierce have combined to create a very productive rushing attack in the playoffs so far. Pierce is a home-run hitter who has longs of 78 and 43 yards in this season's playoffs. Although he is averaging more per carry in the playoffs than Rice, Rice's ability to make defenders miss in space and his receiving talents could see him become the focal point of the whole offense. Rice has been featured prominently in the offense since Caldwell became the offensive co-ordinator, but hasn't produced to his potential. Excluding the final week of the regular season when he was rested for most of the game, Rice has averaged 22.6 touches (receptions + rushes) for 94 yards per game since Caldwell was promoted. The last time he faced the 49ers, he had similarly ordinary-looking numbers, finishing the game with 24 combined touches for 83 yards, although that game was called by former co-ordinator Cam Cameron. On the biggest of stages however, teams typically look towards their biggest performers to carry them to glory. While it doesn't always work out that way, Caldwell should still gameplan to ride Rice as much as possible. The 49ers' front seven is a special group, led by all-pro defensive end Justin Smith. Smith is the kind of interior defensive lineman that plays so fast it often appears he knows what play the offense is running before the ball is even snapped. He has the ability to stack blockers at the line of scrimmage while still stopping running-backs up the middle and his ability to chase down plays designed to run away from his area of the field. Smith has been dealing with a serious triceps injury, but it hasn't affected his ability to stop the run in recent weeks. In New Orleans he will have a very favourable matchup against the inexperienced Kelechi Osemele. Osemele is a rookie right tackle who recently became the Ravens' starting left guard. His ability to contain Smith, even with double team help, will play a major role in deciding the outcome. As a tackle, Osemele is better in space rather than fighting off bigger defenders at the point of attack. Therefore, it makes sense that the Ravens will look to put Rice in space with short passes taking the play away from Smith. Rice consistently turns short passes into big gains, not just that famous fourth down in San Diego. Just like the Ravens offense, not a huge can be learned from the 49ers' regular season statistics. With Alex Smith starting the first 10 games of the year, the 49ers not only had a different quarterback under center, but also a less aggressive offense as a whole and a completely different schematic approach. Having replaced Smith with second year professional Colin Kaepernick, the 49ers offense went from a conservative unit working hard to adequately complement a dominant defense, to an offense that has all the capabilities of blowing out an opponent. Kaepernick barely played as a rookie and has only started nine games this season. In fact, outside of two quarterbacks forced to start because of injury, Jeff Hostetler and Vince Ferragamo, Kaepernick has the fewest starts of any quarterback to start in Super Bowl history. Theoretically, Kaepernick's inexperience should work against him in this game. However, his track record says otherwise. Kaepernick made his debut in Week 11 of the regular season in a convincing victory over one of the best defenses in the league, the Chicago Bears, on Monday Night Football. A few weeks later, he made his Sunday Night Football debut against the New England Patriots in Foxboro. Kaepernick threw for four touchdowns and had the game wrapped up by the end of the third quarter. He did make a nervous start to his playoff debut, throwing an interception on his first drive against the Green Bay Packers, but after that he led his offense to a 45 point day with four total touchdowns and over 400 total yards. In the NFC Championship game, the Atlanta Falcons sold out to stop Kaepernick from running and keep him in the pocket. By doing that they allowed the rest of the 49ers offense to produce, before Kaepernick threw the offense to a comeback victory in the second half. The 49ers' young quarterback has the ability to beat the Ravens with his arm or his legs, or a combination of the two. However, when it comes to stopping the 49ers' offense, the Ravens must remain disciplined and not focus too much on Kaepernick. That was the downfall of the Atlanta Falcons, as they allowed Frank Gore and LaMichael James to combine for three easy rushing touchdowns at the cost of containing Kaepernick. Considering the Packers did the opposite, allowing Kaepernick to run for 181 yards with only six coming after contact, the Ravens must find a balance between the approaches. Stopping the 49ers offense begins with stopping the run. Gore, Kaepernick, James and Anthony Dixon have have combined for 472 yards and seven touchdowns on just 72 carries in the playoffs. If the 49ers were any ordinary rushing team, the fact the Ravens are giving up 128.3 yards per game in the playoffs would be key, but the 49ers run the ball unlike any other team in the NFL. Kaepernick has the option to take the ball and run with it himself on many of the 49ers' running plays. The 49ers also have the most dominant offensive line in the league. No other team in the league combines that level of talent in the trenches and at the quarterback position when it comes to running the ball. Much of the 49ers' running success comes from the option offense: the key aspects of this are that the offensive line deliberately doesn't block the last defender to one side of the field. Instead of blocking that defender, the quarterback reads and reacts to what he does after the snap. If the defender moves inside, the quarterback takes the ball away from the running-back and sprints outside. If the defender stays outside, the quarterback gives it to the running-back who runs up the middle against less defenders. 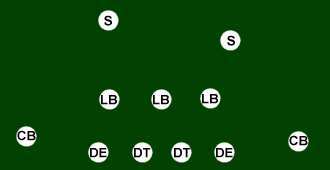 This offense puts a huge amount of pressure on the defensive linemen and outside linebackers. The Ravens tend to flip between a 4-3 and 3-4 formation, but should primarily play 3-4 in this game to counter the 49ers' running game. The 3-4 will allow the Ravens to keep three of 340 lb defensive end Haloti Ngata, 340 lb nose tackle Terrence Cody, 315 lb defensive end Arthur Jones and 345 lb nose tackle Ma'ake Kemoeatu on the field as often as their fitness allows, while Terrell Suggs and Paul Kruger primarily start as outside linebackers. 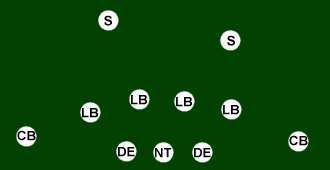 On any given option play, one outside linebacker will be left unblocked and it will be that player's responsibility to contain Kaepernick. Presuming he contains Kaepernick, the Ravens' big bodies inside must then swallow Gore by beating the 49ers' excellent offensive linemen. That is the best way to stop the option, but it requires discipline. The Atlanta Falcons attempted the same approach in the NFC Championship game, but they didn't have the talent or size on their defensive line to stop Gore and the team's other backs. The Ravens will feel comfortable asking their defensive linemen to make plays consistently enough to contain the 49ers offense in those situations. What makes the 49ers offense so dangerous, is that even if the Ravens successfully stop the run, Kaepernick has proven capable of connecting with his receivers consistently from the pocket. During the regular season, Kaepernick completed over 62% of his passes for 1,814 yards, with 10 touchdowns and only three interceptions. In the last two playoff games, he has further improved to 63.5%, 496 yards, three touchdowns and one interception. The 49ers may have lost explosive wide receiver Mario Manningham to injury earlier in the season, but Michael Crabtree emerged into a star receiver when Kaepernick came into the offense, a 35-year-old Randy Moss has made a number of receptions in the playoffs and tight end Vernon Davis awoke in the playoffs after slumbering through the regular season. The 49ers' receiving options are horrible matchups for an injury-plagued Ravens' defense. Superstar cornerback Lardarius Webb would have been the perfect matchup for Crabtree. Webb is probably the best tackler in space in the whole league and Crabtree does most of his best work running after the catch, 626 of his 1,281 yards on the season came that way, but Webb tore his ACL earlier this year and hasn't played since the regular season. Cary Williams, a solid but not great cornerback, will likely take on the responsibility of stopping Crabtree depending on the health of Jimmy Smith. The Ravens are also without starting inside linebacker Jameel McClain because of injury. McClain is more consistent in coverage than his replacement Dannell Ellerbe, while being much more athletic than Ray Lewis at this point in their respective careers. Lewis is too slow to cover Vernon Davis, while the Ravens likely won't trust Ellerbe or Bernard Pollard to do it consistently. Those injuries will force the Ravens to play a lot of zone coverage because they simply can't match the athletic ability of the 49ers' weapons. Since Kaepernick became the starter, the 49ers have only been held under 24 points twice. Both times they faced off against talented defenses who played disciplined football on the day. However, even in those games, against the St. Louis Rams and Seattle Seahawks, Kaepernick only turned the ball over twice. One of those turnovers was a missed pitch that was recovered in the endzone by the Rams' Janoris Jenkins, but Kaepernick was also forced into a safety in that game. The Rams were able to pressure Kaepernick into making two game-changing plays because they were disciplined and aggressive. That is the style the Ravens need in order to win this game. Game-changing defensive plays do come from pressure more often than not, but the Ravens normally look to Ed Reed for their game-changing defensive plays. Reed has had a relatively quiet season - dealing with a torn labrum in his shoulder hasn't helped - but he has proven to be a big-game player. There are two contrasting matchups within this game. The Ravens offense needs to get creative and knock the 49ers defense off balance. The 49ers offense knows exactly what it is going to do, as does the Ravens defense. One side should see plenty of creativity, while the other will simply come down to who can execute better on the day. After kicker Billy Cundiff prematurely ended the Ravens' 2011 season, he was promptly replaced by rookie Justin Tucker. For one so inexperienced, Tucker has consistently shown up when the Ravens needed him this year: in Week 3, he kicked the game-winning field goal against the New England Patriots as time ran out, he kicked all of the team's points in a 9-6 victory in Week 5 against the Kansas City Chiefs, he kicked a game-tying field goal with three minutes to go against the Chargers in Week 12 before kicking the game-winner in overtime. Most importantly, he kicked the game winning field goal in overtime against the Denver Broncos from 47 yards in the divisional round of the playoffs. Tucker only missed three kicks all season, none of which came when the Ravens were tied or behind, and also set franchise records. 49ers' kicker David Akers is in a different place entirely. Akers has dealt with different injury issues throughout the season, which have led to him having his worst ever season. The 49ers have stuck with Akers, keeping faith that he would return to his record breaking form of 2012 in time for the Super Bowl. In 2012, Akers set the record for points and tied the record for the longest field goal ever kicked. As NFL Network's Rich Eisen will tell you, punters are people too. Not only are they people, but they are very important players even if they are rarely appreciated by fans. Both of these teams understand the value of a quality punter. Andy Lee has been considered a valuable weapon in San Francisco for some time now. Sam Koch isn't on the same level as Lee in terms of leg power or accuracy, but he has been a consistently reliable performer. Jacoby Jones vaulted the Ravens' special teams returns to the top of this year's rankings, as well as adding three touchdowns. Jones' ability to break free at any moment could make the difference in a tight game, but Ted Ginn and LaMichael James offer similar potential to the 49ers' special teams. James and Ginn have incredible straight line speed, while Jones has the elusiveness to make defenders miss in open space. Jim and John Harbaugh first faced off against each other back in November 2011, when John's Ravens came out on top in Baltimore. That was the first time in NFL history that two brothers competed against each other as head coaches. Obviously that means that this is the first time ever that two brothers will face off against each other in the Super Bowl. This being the Super Bowl, most of the focus will be on the Harbaugh family and the relationship between the siblings. Once the game begins little of that will matter. The eldest of the brothers, John, has much more experience as a head coach at this level of football and at this time of the year. Since he was appointed head coach in 2008, John's Ravens have made the playoffs every season. The consistency of the team from season-to-season has been incredible, resulting in a 54-26 record in the regular season and an astonishing 8-4 record in the playoffs. It's difficult to fathom years later, but John was actually the Ravens' second choice to be their head coach after Jason Garrett initially turned the opportunity down. John was almost unknown to fans, who were disappointed not to sign the highly thought of Garrett. His career had been spent primarily coaching special teams, with little specialty as an offensive or defensive coach. Instead, Harbaugh brought accountability, discipline and an ability to unify a locker-room. It is that part of his coaching that Ravens players pointed to as the reason they made the Super Bowl this year. What Jim Harbaugh lacks in coaching experience, he makes up for in expertise. Jim has only been an NFL head coach for two seasons, but he also started 140 games as an NFL quarterback, developed an extensive relationship with Bill Walsh (a coach who played a major role in developing the passing ideals that many teams live on in today's NFL) and a very successful four-year stint as head coach at Stanford. That expertise has allowed Harbaugh to turn the 49ers from a 6-10 team in 2010, into a team with a regular season record of 24-7 over the past two seasons, two NFC Championship games and now a Super Bowl. Much like his brother, Jim is able to unite his players and get the very best out of them. Although he is known for his work developing quarterbacks, most notably Andrew Luck, and the rebirth of Alex Smith's career from 2011 onwards in the NFL, Jim has also elevated the 49ers' defense into arguably the best unit in the league. The 49ers ranked 16th in points allowed during the final season of Mike Singletary's reign, but since then they have finished second in both of Jim's seasons as head coach. He and his staff's ability to identify key free agents such as Donte Whitner and Carlos Rogers, while drafting/developing key contributors Aldon Smith, NaVorro Bowman and Chris Culliver allowed the defense to grow around superstars Justin Smith and Patrick Willis. COMMENTARY: The Super Bowl game between the San Francisco 49ers and Baltimore Ravens is going to be a historic defensive battle. If this holds true, the game will turn into a low scoring affair, dominated by the defenses of both teams. Special teams will be critical. 49ers field goal kicker David Akers must come through for the Niners to have a chance to win. The team that can create scoring opportunities with their special teams and commits the least turnovers and mistakes will win. I think the game will be decided by a field goal or touchdown. My prediction: San Francisco 49ers 20, Baltimore Ravens 17 in double overtime. Super Bowl XLVII has been scheduled for Feb. 3 at the Mercedes-Benz Superdome in New Orleans. The San Francisco 49ers will face the Baltimore Ravens, and the game is being nicknamed the Bro Bowl because of coaches John and Jim Harbaugh. The following is a complete TV schedule for the Super Bowl. On Thursday afternoon, Jauary 24, 2013, Apple reported financial results for its fiscal first quarter ended December 31, 2012 that simply demolished Street expectations. iPads - 15.43 million iPads sold in the quarter. iPhones - 37.04 million iPhones sold in the quarter. Macs - 5.2 million Macs sold in the quarter. iPods - 15.4 million iPods sold in the quarter. Trading in Apple shares was halted pending the earnings announcement, but in spite of the good news, the market did not send Apple Inc (NASDAQ:APPL) shares to new highs as had been expected. Guidance was also impressive, especially given the company’s tendency to take a cautious approach when predicting the future. For FY Q2, Apple sees revenue of $32.5 billion, and profits of $8.50 a share. The Street has been projecting revenue of $32.1 billion and profits of $7.99 a share. You can expect all of those to ratchet higher after the astonishing FY Q1 performance. StreetAccount notes that over the last five years, March quarter revenue has been down on average 18% from the December quarter. The guidance suggests a sequential drop of almost 30%. Apple CEO Tim Cook said in a statement. Oppenheimer says customers are “captivated” by Siri. On his comments about the cash position, Oppenheimer elaborated that they have always discussed the cash position. He says that their discussions on what to do with the cash is “active.” When we have something to announce, he added, they will announce it. In response to a question on the company’s position in the living room, Cook said that the Apple TV product is doing well. But he noted that they still classify it as a hobby. But he has nothing new to say about TV products. On 4G and the potential for larger screen sizes for phones, Cook said he won’t talk about the future road map. He says a lot of people out there love what they’re doing. Trading in Apple shares has resumed; the stock is up $31.60, or 7.5%, to $451.91; that boosts the company’s market cap to a highest-ever $415.4 million, just a hair below that of Exxon Mobil, the largest U.S. company by market cap, at $418 billion. COMMENTARY: On Wednesday, January 23, 2013, Apple Inc announced that for the FY 2013 Q2, it expects revenue between $41 billion and $43 billion. According to I/B/E/S Estimates, analysts on an average are expecting the Company to report revenue of $45 billion for the second quarter of 2013. This may account as to why Apple's share price did not spike that much the day after the earnings call. Apple has also lost its lead to Android in smartphones, and its lawsuits against Samsung have not failed to stop that juggernaut from taking the lead in smartphones. As a consequence, many analysts now believe that the era of Apple total dominance, including the death of founder Steve Jobs, has left a void that may never be filled by Tim Cook, Apple's new CEO. I never took much credence in Apple's stock after Jobs passed on, and when Apple stock price hit a high of 702.10 on September 19, 2012, this marked a high that may never be matched by Apple ever again. A lot of that frenzy was driven by sales of the iPhone and iPad and speculation in the stock by hedge funds, many who have since cashed their shares. Apple can no longer depend on the iPhone or iPad to carry its share prices to new highs. The competition is getting better by each day, and Apple under Tim Cook has lost its cache and luster as the king of innovation. It needs a new blockbuster product that can separate and differentiate the company from the rest of the pack. Tim Cook is not the product picker that Steve Jobs was, and that fact alone, leaves investors with their arms crossed and full of doubt as to Apple's future to return to the heydays under Jobs. A new Gartner report projects that worldwide mobile ad revenue will increase 16% from $9.8 billion in 2012 to $11 billion this year and more than double to $24 billion by 2016. Stephanie Baghdassarian, research director at Gartner said. "The mobile advertising market took off even faster than we expected, due to an increased uptake in smartphones and tablets, as well as the merger of consumer behaviors on computers and mobile devices." Regionally, the research firm expects mobile advertising in North America to rise 22% to $3.8 billion this year and reach $8.9 billion in 2016. In Western Europe, mobile ad spending will grow 19% to $1.9 billion and $4 billion in three years. Both regions will close the gap with Asia-Pacific, which has typically led the way in advertising because of its higher mobile adoption rates. The Asian market will reach $4.9 billion this year and almost doubled to $9.5 billion by 2016, while the rest of the world increases to $788 million in 2013 and $1.8 billion in three years. The high-growth economies of China and India are increasingly expected to bolster mobile advertising as their expanding middle classes draw global brands. Gartner believes mobile display ad spending will eventually overtake mobile search. Display will initially be split between in-app and mobile Web placements -- reflecting consumer usage -- before spending on Web display moves past in-app advertising starting in 2015. The Gartner report also noted the rapid rise in consumer mobile use has outpaced ad demand, creating an inventory glut that drives down ad prices. That in turn has led to a large portion of inventory being scooped up by app developers buying ads to promote their apps, while selling similar ads in their own apps. The research firm likened this type of “paid discovery” for apps to the ad bartering that took place among Web sites during the late 1990s, producing an inflated picture of ad revenue that contributed to the dot-com bubble. "Some correction in the growth rate must occur before demand from brand and local advertisers catches up with supply, and more sustainable economics support a faster growth rate commensurate with consumer adoption." It should also be noted that the Gartner forecast for North America is substantially lower than the eMarketer projection for U.S. mobile advertising released last month. The latter study forecasts $7 billion in mobile advertising this year, growing to $21 billion in 2016. Gartner says its estimates including mobile Web display, in-app display, search and maps, video/mobile TV and messaging. They are also based on reported numbers by the main players in the mobile advertising network space (Google and InMobi), and in the digital media measurement space (comScore), as well as industry bodies such as the Interactive Advertising Bureau (IAB). 1.4 billion listener hours -- up 54% compared with the prior year. 67 million active listeners -- rose 41% for the month. Pandora members collectively listened to the equivalent of more than 5,692 years of music on December 24, 2012. During the holidays, 31% of people in the West preferred new holiday tracks compared with classics. Midwest listeners were the earliest adopters of holiday music. Some 52% of people in the Northeast care about music more than food at holiday parties, compared with other regions across the U.S. There are 67 million U.S. users, listening about 20 hours per month. One million are paid subscribers. The company is on track to generate between $422 million and $425 million in revenue in 2013, according to estimates. Pandora CRO John Trimble said the Chrysler Group recently joined the extensive roster of automotive brands to integrate Pandora into its vehicle, making it the 20th automotive brand partner. The service generates revenue from audio and visual ads, tapping into a wide audience across desktop and mobile, from cars to tablets and smartphones. Brands also run promotions to sponsor 30-day trials, Trimble said. Ads get targeted through signals from the member's registration data, such as gender, age, genre, and location. Pandora doesn't use services from companies like Triton Digital, which teamed with eXelate to target in-stream audio ads to digital radio listeners. Pandora, spawned from the Music Genome Project, a DNA map for each musical piece, relies on word of mouth marketing, email, advertising within the music service to listeners, search engine optimization and social. COMMENTARY: Listening and sharing music online couldn't be more convenient or crowded. Options are easily found at the swipe of a finger or click of a mouse: the algorithm, Pandora's radio-style personalized music streaming; Spotify's social-sharing streaming platform; iTunes $1.00 per download music model for Apple-only devices and the cloud-based music downloading services of Amazon and Google on almost every other device. Then there are the smaller streaming and subscription players: Rhapsody (who has missed the social boat so far), Slacker, Rdio, MOG and more. Or, there is straight-up piracy. Ad-Supported Revenue Model - Advertisements running before download -- a highly scable business model, but a costly and money losing revenue model. Subscription-Based Revenue Model - A fixed monthly or annual charge for an unlimited number of music streaming downloads -- a more viability long term strategy for sustainable and predictable revenues. Mixed Revenue Model - Includes both elements of the ad-supported and subscription-based revenue models. Too Much Competition - Too many separate, competing interests fighting for a piece of the music streaming pie. Costly Royalty Deals - Music labels, music publishers, and artists themselves (to a much lesser extent) all have certain terms in their favor including most favored nation, minimum payments, per-play costs, percent of total company revenue, and one of the most head-scratching, detailed reporting of the competition. The problem: The high cost of music content. Although Pandora and Spotify are rapidly growing revenues, the cost that they pay the music companies for all that content is rising faster than revenues are growing, and neither company can seem to make a profit from all their efforts, as you can see from Pandora's content costs and revenue growth. As a result of Pandora's high content costs, it continually operates below the breakeven point, with expenses very often exceeding revenues. It makes you wonder whether there is an optimal revenue model for music streaming companies like Pandora and Spotify. Although Spotify active users reached 20 million in December 2012, of which 20% or five million were paid subscribers (nearly five times Pandora's 1 million paid subscribers), offering unlimited downloads to those paid subscribers comes at a higher cost -- higher royalties to the music companies and no advertising (no ads appear for paid subscribers). Spotify will likely pass the $500 million revenue mark for 2012, more than double that of 2011's $244 million, and with losses still on the books the company is expected to seek a new round of funding, money that will value the company at more than $3 billion. Pandora also expects to lose money in 2012. Like Spotify, Pandora has never generated a profit. For the first nine months of fiscal year endng January 31, 2013, the company generated total revenues of $302.056 million and a net loss of $23.59 million. For Q4 2013, Pandora expects revenues to be in the range of $120 million to $123 million. This would bring total revenues for the fiscal year ending January 31, 2013 to $422 million to $425 million. Non-GAAP loss per share is expected to be between ($0.06) and ($0.09). Non-GAAP loss per share excludes stock-based compensation expense, assumes minimal tax expense given our net operating loss position, and 171 million weighted average basic shares outstanding for the fourth quarter fiscal 2013. For the third quarter ending October 31, 2012, users logged 3.56 billion listener hours, 67% over the same quarter the prior fiscal year. Active users reach 59.2 million growing 47% year-over-year. This averages to about 19.73 million active users per month for the quarter. According to J.P. Morgan, 70% of Pandora's users will be listening to their music via a mobile device (see below) during the fiscal year ending January 31, 2013. Like Facebook, this means that Pandora must shift its advertising focus from the desktop to mobile devices. For its part, Pandora has generated more listener hours, but it must pay the music companies each time a song is streamed. 95% or 18.73 million of Pandora's active users are non-payers (only 1 million are paid subscribers). Paid subscribers during the first nine months of the current fiscal year represent only 11% of total revenues. How much should "free" music cost and who should pay for it? That's the deceptively simple question at the heart of the latest round of legal wrangling surrounding Pandora, which has launched an effort to get federal legislation passed to lower royalty rates paid to musicians so that it may remain competitive. In response, more than 100 artists, including high-profile acts like Rihanna, Pink Floyd and Katy Perry, have signed an open letter opposing the move. The letter states. "Pandora's principal asset is the music. Why is the company asking Congress once again to step in and gut the royalties that thousands of musicians rely upon? That's not fair and that's not how partners work together." Pandora argues that Internet radio royalty fees should be in line with those of other services, such as cable and satellite radio. According to the company, it paid 54 percent of its revenue to record companies and artists last year. By comparison, Sirius satellite radio paid 8 percent. Pandora, however, agreed in 2007 with the artists' and labels' representative organization to its royalty rate. Pandora, like Spotify, is treading water, with a revenue model that cannot be sustained over the long-term, and the company must either charge more for its music streaming, obtain royalty concessions from the music companies, or modify its advertising products to satisfy mobile listeners while generating more mobile adverting revenues. According to Pandora's fourth-quarter financial report, 90 percent of its revenue comes from pop-up and audio advertising, which in the online world not only tends to drive away users (in many cases, to music pirating outlets) but have yet to prove effective, especially as more users shift to mobile devices. Dave Allen, founding member and bass player for the bands Gang of Four and Shriekback, who blogs frequently about developments on the digital music front says. "Mobile advertising is not taking off for many reasons so, like Facebook, Pandora is struggling to make any sizable revenue from mobile ads." AS TESLA SEARCHES FOR ITS MAINSTREAM IDENTITY, WE STILL DON’T SEE WHAT THERE IS TO GET SO EXCITED ABOUT. As of late, the automotive press has nothing but good things to say about the Tesla Model X. Shown for the first time in the flesh at the Detroit Auto Show, it’s already a hit, with $40 million in pre-orders thus far (though to put that figure into perspective, Tesla posted a $200 million loss last quarter). We’re trying so hard to get the Model X, to rally behind the electric car that’s challenged the stubborn suits in Detroit, to fist pump a world that’s less reliant on fossil fuels. But all we see is an uninspired yuppie-mobile (do they still make yuppies? ), a pornographic attempt at erotica. The DDD silicone bust line is the 17-inch touch-screen control panel. The “falcon-wing” doors are a pair of legs that stretch behind a neck. “Why is this necessary?” you ask. “Why not?” Tesla answers quickly, hoping you’ll be so smitten by the high beams that you won’t look too closely at the backend, which is the cross between a Prius and a Pontiac Aztek. The gull-wing doors are of particular note. On a spec sheet, you’ll hear how easily they accommodate rear seating for five. But in practice, you have to wonder, is it really worth having gull-wing doors just to accommodate two extra people crammed into the equivalent of jumpseats? Would a family of seven really look to this car as their comfortable familymobile? Looking back at car history, the gull-wing door--for however extravagant it looked--was actually a practical solution to a common problem. Sports cars rode close to the ground, so opening a door often meant a jewel of a car would scrape against uneven pavement. But the Model X is an SUV (or crossover, if you prefer that invented word). It already has more than ample ground clearance, and from what we understand, the Model X doesn’t actually fly, so gull-wing doors are inherently ridiculous. Then why are the doors even there? Well the Model X is a generic-looking car. Not a single statement within the design is confident enough to say “I’m a Tesla, dammit.” Instead, designers attached these doors to do the shouting instead. Maybe that cheat would be fine if gull-wing doors weren’t such an expensive upgrade in a vehicle, and if their maintenance weren’t legendarily finicky. Instead, every Model X driver is really a donor subsidizing the curbside marketing budget of Tesla’s only, sadly extravagant brand identifier, just so fellow shoppers know that their particular generic SUV is actually really fast, fairly green, and costs a whole lot of money. Honestly, we shouldn’t care this much, and we wouldn’t, were Tesla just another premium car brand that didn’t really matter in the grand scheme of things. But someone needs to come around and make an electric car that’s aimed for the masses yet embodies everything great about “cars” rather than “electricity.” Chevy didn’t get there with the Volt. Tesla once looked like they may be close, at least for the premium market, but their results thus far have been wholly uninspiring. COMMENTARY: In spite of criticism over Tesla Model X's design, it can easily transport 7 passengers, so it is definitely competing in the high-end SUV market. When the Model X was first unveiled in February 2012, price range estimates were somewhere between $80,000 and $100,000 depending on options. For an SUV, the Model X is relatively expensive, but Tesla claims it already has $40 million in pre-orders. Assuming that the average price per pre-order is $90,000, then this equates to about 445 Model X's since February 2012. That's not an impressive number when compared to the Model S, which had over 3,000 pre-orders. Here's the skinny on the Model X. If interested in placing a pre-order on a new Tesla Model X, you will need to make a deposit of $5,000. You can place your pre-order by clicking HERE. NEW YORK’S FIRST PREFAB APARTMENT TOWER WILL RISE IN 2015. ITS 55 UNITS WILL BE VERY, VERY SMALL. On Tuesday, Mayor Bloomberg--trailed by his perpetual entourage of news cameras--stepped through the door of a tiny but neatly kept apartment. He explored the model unit, which currently sits inside of the Museum of the City of New York, pulling down a trundle bed and peering inside of unexpected storage spaces. There wasn’t much ground to cover (only 300 square feet, in truth), and soon Bloomberg migrated to a podium to introduce the unit as the winning design in his AdAPT NYC competition, which seeks to imagine the future of housing in New York. Of course, it’s unlikely that Bloomberg will ever live in a “micro-unit,” but his administration is betting that millions of other New Yorkers will like the idea. Specifically, the city’s 1.8 million households of one or two people, a demographic that has ballooned over the past two decades, growing far beyond the roughly 1 million studio and one-bedroom apartments available in Manhattan. Mayor Bloomberg explained. “The city’s housing stock is misaligned with the changing demographics of its population, largely because of outdated housing codes that prevent the construction of smaller units,"
AdAPT is part of a grand experiment to change that. On a plot of land in Kip’s Bay, the city has agreed to suspend its current housing codes and allow the construction of a tower consisting solely of micro-units under 300 square feet. The winning AdAPT proposal, by a team including nARCHITECTS, developers Monadnock, and the Actors Fund HD, will begin construction on the site next year. Their scheme, "My Micro NY," calls for nine stories of long, thin units stepped back from the street. Each apartment will be prefabricated in the Brooklyn Navy Yard and arranged on site using a crane, saving precious construction days and millions of dollars. nARCHITECTS, who’ve been building living spaces in New York for more than a decade, designed the units to be a bit like a cabin on a ship--full of hidden details. Each unit is divided into a "toolbox," which packs a bathroom, kitchen, and fold-down table into a compact box, and a "canvas," the window-facing tabula rasa that can function as a bedroom, living room, or study. A juliette balcony lets in air, and over head, a step ladder leads to a storage space equivalent to that of a VW Jetta. The firm’s design will pack 55 of the modular units on site, with nearly half priced below market. Florida suggests that cities which expand “out, not up” will breed healthier and more creative neighborhoods. In other words--the city should be looking at how to lure tech startups to Queens and the Bronx, not figuring out how to fit more people in Manhattan. But as long as Manhattan exists, there will be people chomping at the bit to live there--so why not design a better model for how we use space in these hot-commodity neighborhoods? AdAPT isn’t so much about planning how a city should grow--rather, it’s acknowledging how the city is already growing, and planning accordingly. Wherever you fall on the continuum of Jane Jacobs to Michael Bloomberg, there are plenty of alternative proposals on view in Making Room: New Models for Housing New Yorkers at the Museum of the City of New York. Check it out until September 15. In a blog post dated November 10, 2012, I profiled the Keret House, a 4-foot wide house sandwiched within the space of two buildings. The Keret House, was conceived and finally built by Polish architect Jakub Szczęsny and finally finished at the end of 2012. COMMENTARY: It would appear that there are several stark differences between how Chinese students use technology devices in the classroom compared to students in the U.S. Chinese students are more likely to use their devices to colloborate with other students, use technology in all of their classroom curriculum and for technology training. In the U.S. students are more likely to use technology for classroom research and special assignments. 57% of all Chinese students use technology in the classroom 1-2 hours per day, compared to only 30% of U.S. students. 96% of Chinese students are more like to bring their own technology devices to school, compared to only 69% in the U.S. Chinese students (79%) and teachers (90%) are getting more technology training compared to the U.S. students (41%) and teachers (24%). Chinese students consider their teachers more tech savvy than them, where the reverse is true in the U.S. It is very obvious from Dell's findings, that U.S. students are lagging behind their Chinese counterparts when it comes to technology in the classroom, and this is probably due to demographic and economic reasons. The Great Recession and spending cutbacks in the schools has left teachers to fend for themselves. Many students are the children of a single parent, and the parents are unable to afford technology devices for their children. Tough economic times have often been the best times for starting a new business – just ask the creators of General Electric, Walt Disney, Burger King and Microsoft. The slow recovery -- rather than discouraging enterprise -- may actually be the ideal time to make major moves towards the free enterprise dream. With more funding options than ever, cheaper office space, and increases in technology, the time to start a business is now. In fact, 2013 could be a big year for startups, according to Small Business Trends. Many are predicting more businesses will be started in 2013. Part of it led by Millennials who have wholeheartedly embraced entrepreneurship, and part of it from the explosive growth of the freelance economy. In the latest Elance Global Business Survey, 40 percent of respondents were doing online freelancing work on the side while working full-time jobs. Elance predicts with the advent of Obamacare, many of these part-time freelancers will ditch their jobs for full-time freelance entrepreneurship. This infographic presented by ProfitBricks further makes the case for why it’s startup time in America. COMMENTARY: I tend to agree that the environment for raising capital for new startups may never be better. There are still abundant opportunities for startups in the mobile devices, mobile apps and cloud technologies. Robotics and visual reality could be the next next new frontiers for entrepreneurs and investors alike. There are also opportunites in social media for entreprenrus who are able to crack the social media DNA code once and for all. Data mining and sector mostly for big corporations, is now within reach of both small and medium size companies, and big data holds the promise of breakthrough methods in marketing and reaching consumers. The development of crowdfunding and the recently enacted Jumpstart Our Business Startups Act or JOBS Act provide exciting new opportunities for raising capital through donations and sales of equity securities through both private and public markets. Dark clouds remain on the horizon as roblems in the Eurozone and our own fiscal cliff and debt ceiling issues could prove problematic and many investors may hold off making investments in risky ventures like startups. True entrepreneurship and innovation will win the day. If you have a great new idea that fills a big need or solves a big problem, and you have the team, successful and proven business model and strategies to executive your marketing initiatives, you will have an easier time raising venture capital. For a complete discussion of startup entrepreneurship and venture capital see all my blog posts HERE.